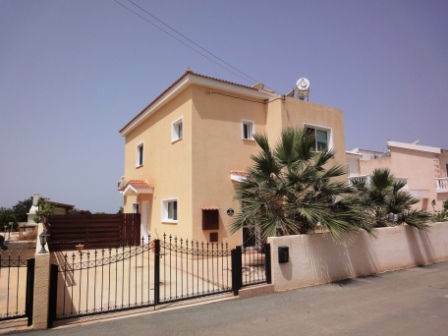 Cyprus Property Blog by Cleo : Peyia Villa with Sea Views - Great Price Reduction! Peyia, Paphos - This impressive 3 bedroom detached villa is located in a quiet residential area of Peyia, which is a popular village a few minute’s drive away from the well known sandy beaches of Coral Bay. There are a wide range of amenities nearby, including supermarkets, shops, and a good variety of restaurants and tavernas. The ground floor features a spacious open plan living room with a fireplace and fitted gas fire. Patio doors provide lots of light to the space and access to the outside terrace and swimming pool. An attractive archway leads to a large kitchen with plenty of cupboards and granite worktops, and space for a washing machine, dishwasher and American size fridge/freezer. A built-in oven, gas hob and extractor are included, and there is convenient direct access to the driveway where there is room to park two cars. Also downstairs is a double size bedroom with fitted wardrobes, and a shower room with double size tiled shower. At the top of the marble staircase is a landing with direct access to a large balcony with stunning sea views, which can also be accessed from the master bedroom via patio doors. The master bedroom has a wall of fitted wardrobes with sliding doors, and an en-suite bathroom with corner bath, and the second bedroom, also with fitted wardrobes, has an en-suite shower room. Outside, the plot is very private with a large terrace area and outdoor kitchen at the side with fitted barbecue and sink – fabulous for outdoor entertaining. The fibre glass swimming pool has steps for easy access and there is a shower room with double size tiled shower, sink and toilet. The finishes are very high quality and there a lot of extras with this property. It is priced to sell and has full title deeds.